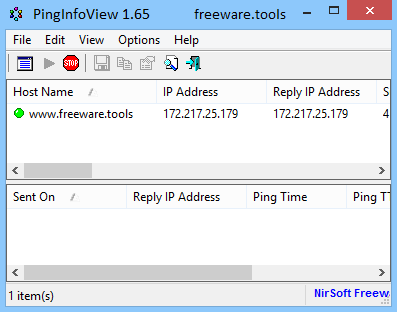 PingInfoView is a lightweight software solution that can automatically ping user-defined hosts and display the results in a clean and well-organized GUI. PingInfoView is a small utility that allows you to easily ping multiple host names and IP addresses, and watch the result in one table. It will automatically ping to all hosts every number of seconds that you specify, and displays the number of successful and failed pings, as well as the average ping time. You can also save PingInfoView's results into text/HTML/XML file, or copy it to the clipboard. In other words, you can ping multiple host names and IP addresses, then watch the result in one table. PingInfoView is a lightweight software solution that can automatically ping user-defined hosts and display the results in a clean and well-organized GUI. There are plenty of pinging utilities on the market, but PingInfoView hopes to make a name for itself with the help of an intuitive interface and multiple advanced features. Once you install and launch the application, it prompts you to write down the addresses to ping, which can be either a typical IP address or a hostname. Additionally, you can define the ping timeout in ms, ping interval, use IP-host description format and start pinging immediately. The main window of the program is the one that displays all the information, including hostname, IP address, reply IP address, succeed and failed count, last ping status, TTL and time, average ping time and last succeeded on date. While you can always stop the pinging session at any given time, PingInfoView also comprises a bunch of other helpful utilities, so it can show time in GMT, mark failed pings and even beep on failed pings. Last but not least, PingInfoView can generate HTML, TXT or XML reports either on selected or on all displayed items. The CPU and memory footprint is minimal and PingInfoView works smoothly on all Windows versions, without the need for administrator privileges when launched on Windows 7 workstations. All things considered, PingInfoView is one of the easiest to use and the most powerful pinging utilities on the market, offering not only an excellent interface, but also plenty of options to enhance the whole experience with the program.